It has been my experience that the largest majority of people want to be successful. They want to do their jobs well. They want to live their lives well. The highest performers want to be held accountable, and they want their teammates to be held accountable as well. So why is it that the number one thing that leaders want to be more effective at is holding people accountable? This month we explore accountability: how we look at it individually and how our corporate cultures impact it. We will also talk about how you, as a leader, can improve your ability to hold others accountable. I know that I am still learning how to do this effectively. One of the things you would expect to see is that those organizations that do this well tend to have a more engaged workforce and are more productive and profitable. If we broaden our discussion of accountability to include our personal life, I believe we will see that people who are accountable will be happier people leading more satisfying lives because they can create and sustain meaningful relationships. I hope that March will be a continuation of an outstanding 2017! Thanks to those of you who continue to encourage me in my writing. I will continue to work to bring you topics of interest and insights of benefit. Not long ago, The Workplace Accountability Study revealed that 82% of respondents have no ability to hold others accountable, but 91% of people rank Accountability as one of the top development needs in their organization. That is a serious gap and a serious opportunity within organizations to grow. I teach classes and workshops in the fundamentals of coaching. At its core is helping others to be more self-accountable and self-responsible. The foundation of getting there is understanding that we have choices, and those choices help determine results. Personal accountability starts with the acknowledgement that we are responsible for our choices. The other thing we explore in our classes is behavioral tendencies. One of the things we discuss is what personalities tend to be more conflict adverse. Nationally, about 80% of the population is conflict adverse. This often plays out in leadership as “I struggle with difficult conversations.” Many of these conversations are around accountability. I don’t know if there is a correlation between this tendency and holding others accountable, but it is something to consider. Of all our choices, the ones we make concerning how we approach both our work and our relationships are most critical. These choices reflect our core values and what we want. How we ‘show up’ is often determined by the choice to be present; to do our best work; to be reliable, predictable, and caring. How we show up helps to determine how we build trust with others. As we know, trust is foundational to our relationships and how we work in our teams and in our organizations. How we hold others accountable can help build trust and feed their engagement, or it can work in other directions. Those leaders whom I have found to be good at holding others accountable tend to be good communicators. They start with how they communicate what they want. They are clear about the expectations for how the job is to be done, the results they want, and how they will be measured. They provide positive feedback as to what the employee is doing well, and they correct the employee when necessary. Based on this approach to the relationship, employees have confidence that the leader has the employee’s best interests at heart. 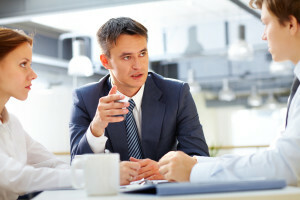 Conversely, those leaders and organizations that aren’t as good with accountability are often not as good at communicating, particularly the on-going performance feedback. Part of this starts at the top with the CEO, and part of this is within the senior leadership team itself. Too often, accountability is all about communicating what is going wrong. Working in this environment is discouraging. The workforce is neither engaged nor productive, and the organizations are not as successful. Often, at the core of cultures with lower accountability, we find low trust. Once the culture of distrust gets a foothold, it can be very difficult to turn around. As Patrick Lencioni points out in The Five Dysfunctions of a Team, the absence of trust is accompanied by a fear of conflict, which leads to a lack of commitment and to an inattention to results. All of them contribute to underachieving. Accountability. At times, it seems mysterious, elusive. At other times, straightforward. Where are you at being accountable? Where is your organization? What’s missing? So it’s 4 p.m. and the day has been agonizingly long. Here are some ideas around “soft projects” that have value, but won’t over tax your brain in the last hour. Coaching is the fastest way to take you to another level of effectiveness.